Transparent mesh is a very effective way of excluding pests from vulnerable plants. It is often used without supporting hoops. The main purpose of insect-proof mesh is to keep pests such as cabbage white butterfly and flea beetle off crops. Creating a physical barrier helps reduce the need for garden chemicals. The mesh looks a little like net curtains but is made of clear polythene. Mesh sizes are significantly more open than horticultural fleece meaning it provides little extra warmth. However, it does give good wind, rain and hail protection. Used as a physical barrier, insect proof meshes confer protection against insects often without significant increases in temperature (depending on mesh size) but with good protection against wind and hail. They also intercept heavy rain reducing the damage that large raindrops can do to soil structure, seed beds and seedlings. Soil splash that can contaminate leafy crops is also reduced. Soil pests such as carrot fly and cabbage root fly are better controlled by insect proof mesh than the pesticides that they have replaced, and the extra shelter leads to better plants and heavier crops. Stretching mesh even by placing over hoops can widen the mesh and reduce efficacy. Check manufacturer’s instructions. The edges of the mesh are best buried under at least 5cms of soil. Plants should not be cramped as they grow under mesh coverings and slack should be included when covering to allow for plant growth. Although horticultural fleece excludes pests very effectively it is much less durable and can be easily damaged when removed for weed control. Fleece can also raise temperatures and humidity to levels that might be undesirable. Crop rotation should be practised as any pest that gets through the mesh might persist until the following year ready to multiply when the same crop is planted and the fleece replaced. Fleece should be used where crops are to be provided with extra warmth or frost protection. Raised humidity levels and subsequent soft, lush growth produced when growing under insect proof mesh may encourages diseases such as Botrytis and downy mildew. Slugs and snails can be encouraged by the higher humidity beneath mesh. 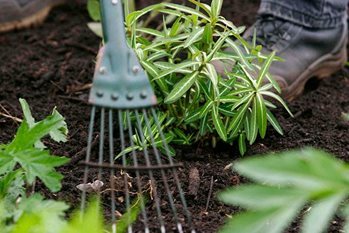 Unfortunately it is usually necessary to uncover plants every two to three weeks to hoe, weed and also thin seed sown plants. This risks ingress of pests which once inside the mesh are likely to multiply. Insect-pollinated crops such as strawberries and courgettes are unsuited to growing under insect-proof mesh during their flowering period. Wildlife can be at risk from poorly erected and managed garden netting. Very fine mesh, such as insect-proof mesh or horticultural fleece, is one of the safer options but it is essential to secure the edges of the mesh by burying under the soil or anchoring to a ground level board half sunken in the soil. Birds in particular can become entangled in loose netting which may result in their death or injury. Insect proof mesh may last five to ten years but unfortunately cannot be easily re-used or recycled. Insect-proof mesh is offered in pre-cut sizes, a variety of widths and any length can be ordered ‘off the roll’. The larger the sheet and the closer it is to manufactured sizes the less it costs per square metre. Mesh is also sold in varying mesh sizes. The smaller the mesh the smaller the insect excluded but the greater the cost and also potential increase in temperature (finer meshed insect proof material may lead to a significant warming for the covered crops) and humidity beneath. On the other hand finer meshes tend to be lighter and easier to use without supporting hoops. Standard mesh: 1.3-1.4mm Good for soil pests such as cabbage root fly, onion fly, bean seed fly and carrot fly, as well as moth and butterfly pests. Birds and mammal pests are also excluded. Although theoretically capable of penetrating mesh, mammals and larger birds seldom do, so there is rarely any need to add further protection such as bird netting. However, they are unreliable in excluding small insects such as aphids, flea beetle, allium leaf miner and leek moth. Fine mesh: 0.8mm Good for very small pests such as flea beetles and whitefly, moth and butterfly pests, leaf miners (including allium leaf miner), greenfly, blackfly, as well as soil pests such as cabbage root fly, onion fly, bean seed fly and carrot fly. Birds and mammal pests are also excluded. Ultrafine mesh: 0.3-0.6mm This size gives good protection against thrips, flea beetles and other very small pests. Birds and mammal pests are also excluded. Butterfly netting: Fine nets with a 4-7mm mesh give good protection against cabbage white butterflies as long as the foliage does not touch the net, and of course bird and mammal pests.